We are off the beaten path. You won't find any signs on your way here and if you rely on our neighbors to give you directions they'll send you far, far away. Yet, less than an hour away from Little Rock and 20 minutes from Conway, Cadron Creek Outfitters offers one of the best whitewater wilderness paddling experiences that can be found in central Arkansas. Here you will find beautiful scenery with towering bluffs and waterfalls and a current that moves along at such a brisk clip you might even forget to paddle. Cadron Creek is Arkansas creekin' at its best! From Little Rock take I-40 west to Conway. Exit onto Highway 65.
you will take another right on Pinnacle Springs Road (Highway 310). Follow Pinnacle Springs Road across a 2nd bridge over the Cadron. Go up the hill and take a left on Cargile Lane at the crest of the hill. Follow this road to adventure. We're so far off the grid -- and a little out of our minds -- that being lost comes natural to us. But for those who are adverse to getting lost -- or who simply wish to rely on the latest technology to find adventure -- you can also track down Cadron Creek Outfitters using your GPS or Smart Phone (Lat 35.3266 Lon -92.3822) or by using the map below with Google or Mapquest. Fortunately once you're on the river you can't get loss. Creekin' - v. immersing oneself within the ecosystem of a small stream such that life becomes totally spontaneously and one feels inextricably linked to nature and the worries and stresses of their lives become distant. Creekin' represents a state of mind that is just the opposite of being "up a creek" (being placed in a difficult, unfortunate position). When we talk of being "down the creek" or "in the creek" or "down at the creek" it be all good. The Cadron offers exceptional creekin' and many ways to get down and dirty and intimately connected with nature. 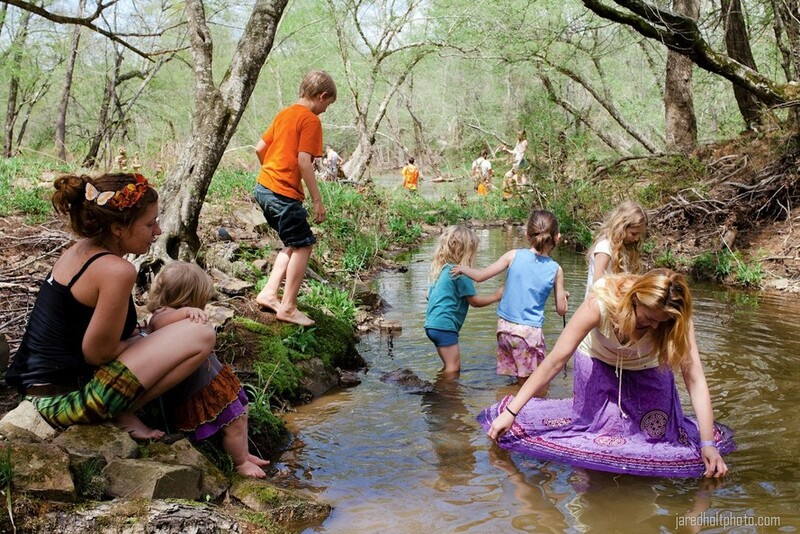 Kids should be strongly encouraged to go creekin' and wander about a bit while at camp. Remember that crayfish, turtles, lizards and dirt pies can be played with safely. A small pool of water can keep a kid busy all day and the Slough at Pinnacle Springs Campground and Steps Pool at Batesville Mountain Campground offer a great place for kids to practice their paddling skills safely -- they have smooth bottoms and are never more than 3-4 feet deep. Creekin' is also good for adults. Jered Holt has moved to Washington D.C and is no longer scouting out people and places here in Arkansas to capture. Fortunately his large and amazing portfolio and his web site continue to tantalize the visual senses with captivating composures and exposures. Check him out!